The Silhouette can cut so many varieties of specialty media it's hard to list them all. Silhouette offers a few different media types to get your creativity going in a new direction. Contains two 8 1/2" x 11" sheets of printable tattoo paper. Print your favorite designs from the Silhouette Online Store on this unique paper with your home inkjet printer. Then, with the included adhesive, use the Silhouette's print and cut feature to cut around each printed design. 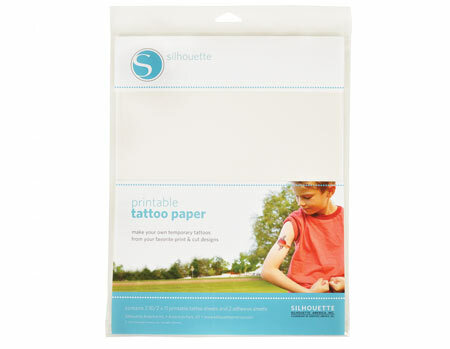 Silhouette temporary tattoos apply easily with water, generally last a day or two, and can be removed with a washcloth and warm water.